In the past several months, I have had the opportunity to travel around the state to meet stakeholders and present to groups and organizations working to impact the opioid crisis in their counties, regions, and statewide. In March, Lieutenant Governor Rebecca Kleefisch, myself, and stakeholders from Waukesha County met with U.S. Health and Human Services Deputy Secretary Eric Hargan to share with him the many ways the crisis is being addressed in Wisconsin, highlighting specific efforts in Waukesha County. In my trips to Kenosha, La Crosse, Milwaukee, and Vilas counties, I was impressed to see the number of organizations and partners collaborating and being invested in combating the crisis. The dedication and commitment to work together, have a common vision, and share resources is how we're going to make the biggest impact. Meanwhile, I was gratified by the turnout for the Opioid Forum hosted by the DHS Division of Care and Treatment Services on April 11 and 12. 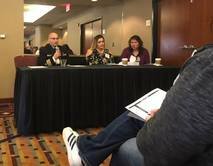 The event covered topics ranging from preventing opioid misuse to treatment for pregnant and parenting women, to the correct way to use naloxone. Knowledge is power, and I know those attending left empowered to face the opioid challenges in their communities head on. Involving all sectors, some that may seem like non-traditional partners, is a key to our efforts. Every person is impacted by the opioid crisis and everyone can play a role in making a difference, so everyone can live their best life. Governor Scott Walker visited Bellin Hospital, a partner in the ED2 Recovery program, in Green Bay April 9, where he signed Assembly Bills 906 and 907 into law--the 29th and 30th bills signed by the Governor that address the state's opioid crisis. All 30 bills the Governor signed were created as part of the HOPE (Heroin, Opiate, Prevention, and Education) Agenda. Nearly 200 professionals responding to Wisconsin’s opioid crisis learned how to be more engaging, empowering, and effective in prevention and treatment services through the application of trauma-informed care at a training held in Wauwatosa March 8-9. Trainers Carol Ackley and Roberto Rodriquez explained that trauma-informed care provides hope and healing to individuals, families, and communities. They said strategies to address the opioid crisis must recognize trauma as a driver of addiction. Watch the webcasts. This training was organized by the DHS Division of Care and Treatment Services. People who work in hospital emergency rooms are invited to take a short survey. The results of the survey will be used to inform the development of tools for emergency room clinicians aimed at reducing opioid overdoses in Wisconsin. Access the survey. 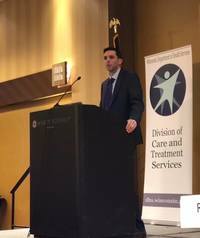 DHS Division of Care and Treatment Services Administrator Patrick Cork announced at the Opioid Forum that DHS has awarded four $250,000 grants to one county, one tribe, and two nonprofit organizations to support expansion of medication-assisted treatment for opioid use disorder. The grants were awarded to Forest County Potawatomi Community, Milwaukee County, Southwestern Wisconsin Community Action Program, and Tellurian. Medication-assisted treatment uses medications approved by the Food and Drug Administration, along with therapy and support, to address issues related to addiction. Research shows medication-assisted treatment is the most effective way to treat opioid use disorder. DHS Director of Opioid Initiatives, Paul Krupski, welcomes attendees to the two day forum at the Hyatt Regency in Milwaukee. Lieutenant Governor Rebecca Kleefisch and Attorney General Brad Schimel also spoke at the forum. Former BMX Elite Pro Tony Hoffman talks about his own recovery from substance misuse and encouraged an end to stigma that prevents many from getting help. Watch Tony's presentation. Sharing personal stories of how the opioid crisis has had on their families. DHS is accepting applications from organizations interested in establishing and operating a statewide addiction recovery helpline. The selected applicant will receive $400,000 to provide information, referral, and assistance to people seeking help with addiction-related needs. The deadline to apply for this grant is May 10. View the grant funding opportunity announcement. Unused medications do more than clutter your medicine cabinet, they can be dangerous and lead to accidental poisoning, overdose, and abuse. Thrown in the trash, unused medications can be retrieved and illegally sold. Flushed down the drain, they can contaminate the water supply. 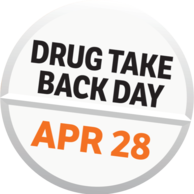 Drug Take Back Day is the perfect opportunity to safely disposed of the unused medications you have around the house. Find a drug take-back site near you. 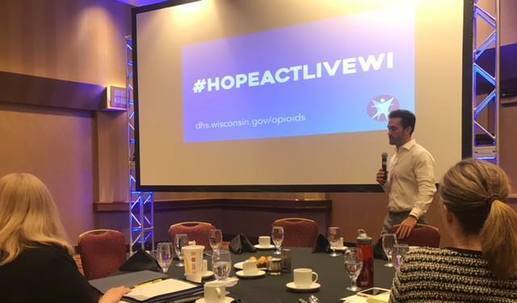 #HopeActLiveWI: Responding to Wisconsin's Opioid Crisis is published quarterly by the Wisconsin Department of Health Services. Please share this newsletter and encourage your colleagues to sign up to receive it. 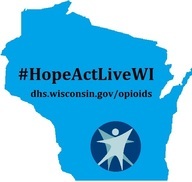 You can also follow #HopeActLiveWI on Facebook and Twitter. Join the conversation! Please do not reply directly to this email message. If you have a question, please email the Department of Health Services. Additional information about Opioids is available on the Department of Health Services website.